Museums are a fun learning experience for the entire family, and make for the perfect winter field trip when you want to defrost a bit! Located in the city of Normal, the Children’s Discovery Museum’s mission is to inspire the love of learning through the power of play! Spend a day with the kids exploring many hands-on exhibits while they put their imaginations to work. Admission is $7 for everyone ages 2 and up. There is free parking available on most days, or you can park on the a parking deck for $1 an hour. The museum is closed on Mondays so be sure to plan your trip for another day and call ahead to see their hours of operation. The Prairie Aviation Museum in Bloomington has a wide variety of aviation related exhibits. Airplane lovers will enjoy their extensive collection of space and other aviation items! Admission is $5 for adults and $3 for children over 5. They’re open Thursday through Sunday, but have odd hours so check their website for exact times before you head over. Think you can handle the cold? Bundle up and head out to these awesome spots! Eagle Watching can be relaxing and enjoyable. The Cache River Wetlands offers the opportunity to spot eagles as well as other birds. They also provide resource materials to get you more involved in what you’re seeing. This list of Illinois Ski Resorts will keep you busy for a while! I also like to know when ski resorts are open or closed, so keep an eye on Ski Central for updates. Some locations may have ski product rentals, but you may want to be prepared with your own ski equipment. Don’t forget about Lake Michigan! Yes, it’s going to be cold – really cold – but it’s worth the trek just for the views alone! If you have the time (as well as a hat, scarf and gloves! ), consider renting a Divvy Bike and riding up and down the paths by the beach! On select days in November and December, you can experience the Fox Trolley Polar Express in South Elgin. The trains are heated, and pajamas are encouraged! The train transports you to the “North Pole” where Santa will be waiting. Tickets are $29.70 each and you must get them ahead of time as they do sell out. There is more to Illinois than Chicago, but Chi-Town is definitely worth visiting – for as long as you can! And yes, even in the winter! Millennium Park is the obvious choice, but don’t overlook the rest. As a Chicagoan myself, I always enjoy visiting the landmarks, museums, and events in Chicago – and I know you will, too! An obvious choice because it’s inside, the Chicago Symphony Orchestra is perfect entertainment for a date night “out on the town”. They offer programs for adults, but they also offer amazing programs for children. Try to plan a trip so that you can have an amazing experience with the family. Plan your visit to the Chicago Children’s Museum around the free and discounted days if you want to save a few bucks! Exhibits include the Treehouse Trails, Kidstown, and more. Plus, since it is located at Navy Pier, you can plan play miniature golf, go on the Centennial Wheel, visit the beautiful crystal gardens, and have an excellent meal! The SkyDeck is a one-of-a-kind experience for kids and adults alike. Located in the Willis Tower, the SkyDeck will let you see Chicago like the birds do – with what seems like no ground beneath your feet! If you haven’t visited the Shedd Aquarium yet, what are you waiting for?? Explore the world’s oceans, rivers, and reefs, along with 32,000 animals all without leaving the city. Plus, it’s inside which means you’ll stay nice and cozy. Learn a thing or two on your trip! The Museum of Science and Industry brings science to life for guests of all ages. A few of the things on my “must list” are the Coal Mine Exhibit, the Submarine Tour, the Mirror Maze and the baby chicks. The Field Museum is a location that you can’t miss. Between Sue, the largest T. Rex ever found, the Egyptian history section with the largest collection of mummies and the DNA Discovery Center, you will walk out with a whole new appreciation for natural history. Be careful when you enter The Art Institute because you may never leave! With over 300,000 thousands of pieces of artwork, you will be able to see everything from Chinese bronzes to contemporary design to textiles to installation art. For an even more comprehensive list of things to do in Chicago, check out my list of Chicago Family Staycation Ideas. Illinois has so much to see, but you don’t have to wait until summer! 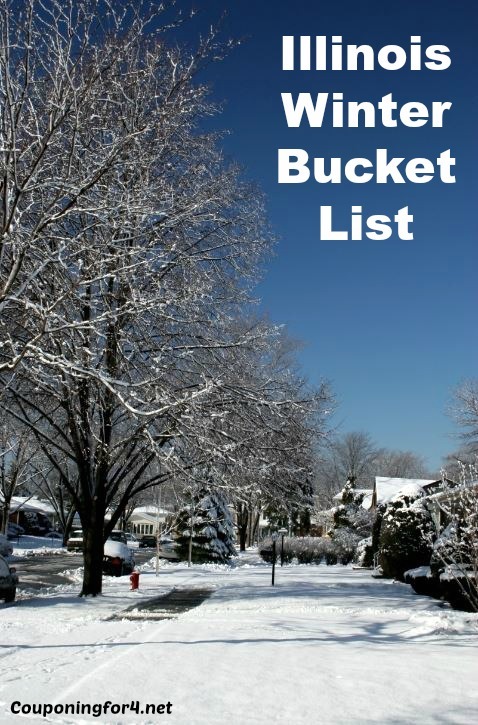 Use this Illinois Winter Bucket List to get you in motion even in the colder months!